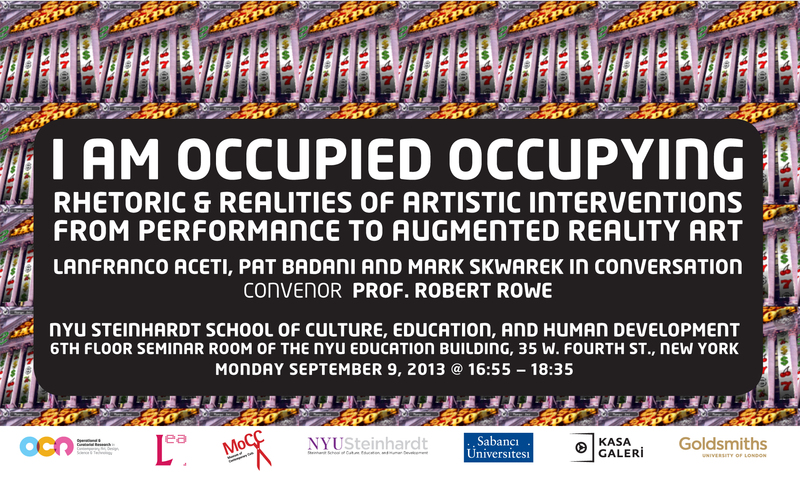 I Am Occupied Occupying: Rhetoric and Realities of Artistic Interventions from Performance to Augmented Reality Art is a talk at NYU Steinhardt School of Culture, Education and Human Development, Monday September 9, 2013 at 16:55. The discussion, convened by Prof. Robert Rowe, will see curators Lanfranco Aceti and Pat Badani analyze together with AR artist Mark Skwarek, the meaning, possibilities and limitations of contemporary AR political interventions as art form. AR artworks have invaded the air bringing into the limelight the medium itself, and the new artistic interventions that deploy said medium. Yet, considering the ‘end’ of the Occupy Wall Street movement, can we now quantify the political and aesthetic impact of AR interventions? And, what have these artworks contributed to art history’s aesthetic debates on performance and on politically engaged practices as ’bearers’ of change? In 2010, Mark Skwarek initiated the AR occupation of Wall Street project, bringing together numerous artists from all over the world. In hindsight, and in light of the political phenomenon of new global Occupy movements, can we now gage the success and the failures of these art interventions? More importantly, what has this practice contributed anew to the debate on “public art”? The panel’s exchange will take the form of a discussion modeled after a trial, with Mark Skwarek presenting his case, with Pat Badani acting as defense attorney and with Lanfranco Aceti as prosecutor. Prof. Robert Rowe, as the convenor, will moderate the debate. The talk follows the publication of a seminal issue on Augmented Reality Art titled “Not Here Not There” Volume 1 and Volume 2, published by the Leonardo Electronic Almanac and edited by Lanfranco Aceti and Richard Rinehart. I Am Occupied Occupying: Rhetoric and Realities of Artistic Interventions from Performance to Augmented Reality Art will become the foundation for future research and projects on interventionist political and aesthetic strategies at OCR. Image credit: Jackpot, 2012, Mark Skwarek. Location-based Augmented Reality iPhone screenshot. This work was located over Wall Street during the events of the ‘Occupy Wall Street’ movement, in 2012.